Wigwams Today . . .
We were traveling on US 26 about two miles east of the town of Sandy in Clackamas County, Oregon . . . just past Shorty’s Corner. 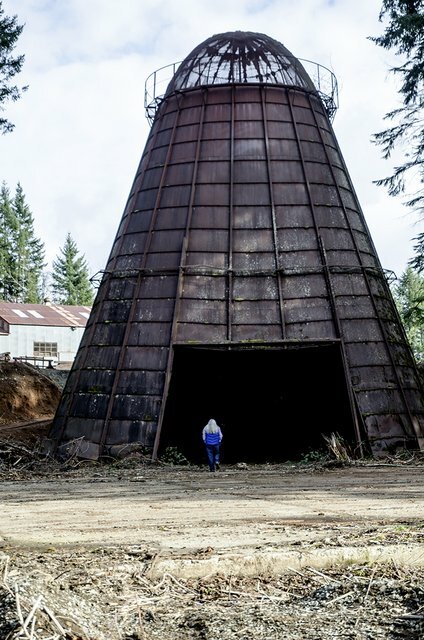 Recently cut trees along the north side of the highway exposed a cone-shaped structure that used to be a common sight standing next to a sawmill in timber country. Every sawmill . . . and they were numerous . . . probably thousands . . . had one. It’s rare to see one today. The cone shape reminded folks of the shape of a dome shaped tent (a wigwam) used by some North American Indian peoples. Sawmills created immense quantities of sawdust and since sawdust creates flying embers when it burns, these 72-foot structures were used to contain those embers. “How did they get the sawdust inside the wigwam,” my companion asked. Sawdust was usually moved by conveyer belt to an opening near the top of the wigwam. The sawdust was dumped right on top of the fire and the embers would fly. Screens at the top helped contain the embers, but quite a few fires still started. “Would you go over to the wigwam so I have a size reference in my photo?” I asked. Golden Crown Sparrow Alert . . .